Home EVENTS	FFA Cup Comes To Coledale! For the first time ever, an FFA Cup match will be held at St James Park in Coledale. 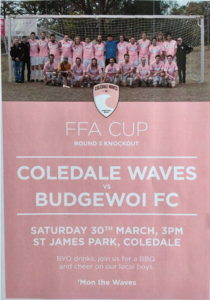 The Coledale Waves will take on Budgewoi FC for a place in the second round of the prestigious competition in what will be the biggest event in the history of Coledale’s All Ages side. The local community is invited to attend the match to support the local side as they strive to make history by becoming the first Football South Coast Community League team to qualify for Round 2. 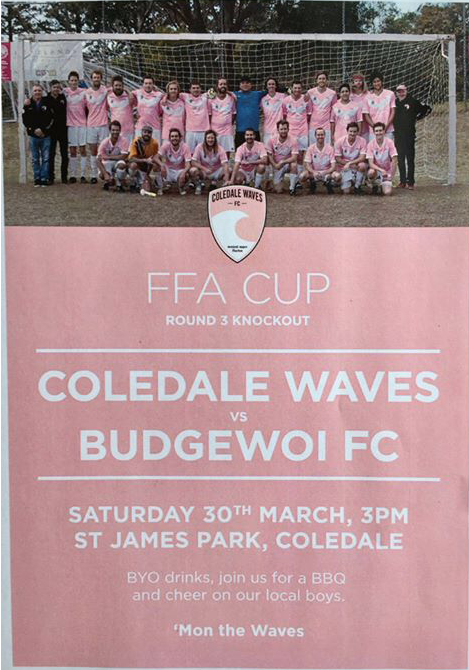 Supporters are encouraged to wear pink to show their support for the Coledale side. To celebrate the day there will be a BBQ and a raffle, drawn during the half-time interval. Kick off is 3PM, with refreshments and festivities taking place at Coledale RSL after the game (regardless of the result)!